During the tenure of Commissioner for Digital Agenda Neelie Kroes, the European Union has invented a political appointment called Digital Champion. Champions, one per country, are appointed by national governments. According to their official website, they are expected to “help every European become digital”. No explanation is offered on just how it is expected that they will accomplish that, but we can attempt to make an educated guess at that by reverse engineering the institution design. Digital Champions receive no compensation, have no staff and no budget. Their only formal obligations is to meet at least twice a year. I interpret this as follows: Digital Champions operate by moral suasion. They apply pressure by virtue of their personal influence: their formal status as advisors to the Digital Agenda Commissioner should give them some extra clout, in the sense that they can theoretically call on the Commission to support them in prompting the member states to forward the Digital Agenda. Italy has had four digital champions so far. Regrettably, the first three have made no impact at all that I could see. The fourth one, charismatic journalist Riccardo Luna, has come up with an idea that might change completely Italy’s officialdom’s approach to all things digital. Appointed on September 2oth 2014, he immediately announced he would use the institutional legitimacy granted to him by the appointment to enable many, many people to act as digital champions. To a first approximation, he wants each one of Italy’s 8,057 local authorities to have their own Digital Champion; he also envisions a dozen, slightly more experienced people to act as a “help desk”. All these people are to coordinate through an NGO, formally constituted on November 20th. In essence, Italy’s Digital Champion is now a collective, distributed agent. Its activity is being crowdsourced. I consider this to be a major hack of the Digital Champion institution – possibly the most radical policy hack I have witnessed firsthand. For two reasons. It increases the influence of very many digital activists by institutional endorsement. In a sense, this is not so different from the mechanism designed by Kroes, but the scale is two orders of magnitude larger. Take Antonino Galante, a small ICT entrepreneur who has been appointed the Digital Champion of Patti, a small Sicilian town of 13,240 inhabitants. Luna expects that Galante can now be a little more persuasive in asking the Mayor of Patti to adopt open source software for the Town Hall; a little more effective in connecting local geeks with headmasters to further digital literacy initiatives. Why is that? Because he can call Luna himself in Rome, and ask for help. And Luna, by virtue of his appointment, has access to the Prime Minister and to the European Commissioner; and by virtue of his own professional position, he has access to national media. If you are the mayor of Patti, you are still facing Galante’s moral suasion, but someone, a couple of levels up from him, wields a lot more firepower than you. It will practically never get used, but it is there. This seems to be a candidate solution the problem (dear to my heart, and very tough indeed) of building interfaces between bureaucracies and networks. It creates an agent which starts with institutional legitimacy, but is completely independent from any public institution and is likely to last longer than Luna’s tenure. Like Luna himself, his small army of local digital champions will not receive any money – but the newly minted Digital Champions NGO is eminently fundable by virtue of size and scope. The Italian private sector is desperate to get the country onto the digital economy bandwagon, and 8000 members, by paying a small annual contribution of 30 euro, can easily support a small full-time staff. It is unrealistic for an NGO with that kind of membership and financial autonomy to take orders from whoever the next appointed Digital Champion will be. The government has simply no leverage to rein it in, other than Luna’s personal charisma. If the NGO stabilizes, the country will have created a permanent high-level actor, a force to be reckoned with. For the moment, it does not look like the 8000 Digital Champions have any political opponent – quite the contrary. Prime Minister Matteo Renzi attended the full length of the NGO’s launch event, signaling he is comfortable with how Luna is interpreting his role. Thousands of Italians cheered on through social media, and the day after the launch Luna reported receiving 20 applications per hour from Italians wishing to serve as local digital champions. The private sector – desperate to get Italy on the digital economy bandwagon – indicated it wants to play ball, with Telecom Italia pledging 250,000 euro to the new NGO before it was even formally constituted. Even traditional media endorsed the initiative, with national TV live covering the launch event. This lack of controversy is largely attributable to Luna’s inclusive style and personal credibility. 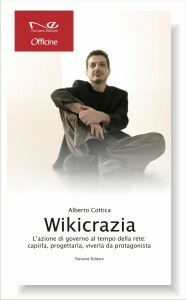 Politically non partisan, he is one of Italy’s foremost journalists on technology and innovation, he served as the first chief editor of Wired magazine in Italy; led a campaign for the Internet to be awarded the Nobel Peace Prize; got the Maker movement on Italy’s mainstream radar, bringing to Rome Europe’s largest Maker Faire; co-founded and still chairs Wikitalia, possibly Italy’s foremost civil society organization on open government. Technology companies love to fund his projects – also because, he says “I never took a cent for myself, I do all this for free and support myself with my day job as a journalist”. Intensely anti-materialistic, Luna has discovered that there is power in not getting paid. When would-be Digital Champions detractors asked sneeringly how much the paxpayer had paid for the initiative, he looked them in the eye, answered “not one cent”, and added that he has paid for the launch event with the money he had been saving for his 50th birthday party, and several of his friends and supporters chipped in by providing free services. It is hard to argue with someone that committed. The only criticism lurking in the background maintains that the digital champions mission is essentially a public one. Many people feel that Italians pay taxes for their public sector to accomplish this mission, and it is unfair for unpaid, self-financed volunteers to take it up. There is a fairness issue: some (in the public sector) are paid to further the digital agenda but do not do the work, while others (in civil society) do do the work, but are unpaid. Digital Champions (of which a minority works in the public sector) tend to agree, but reply that this is the hand this generation has been dealt, and a deep fix of the Italian public sector is unrealistic in the short term. Let’s get the job done, we will argue fairness later. Full disclosure: I know Riccardo Luna well and consider us to be friends. Our friendship consolidated as we founded together Wikitalia (he serves as president, I on its board) and took it forward. I trust him personally, find the Digital Champions project fascinating and accepted to serve on its board, advising local digital champions on Internet-enabled citizen participation and collaboration. This entry was posted in Open government and tagged Digital Champions, digital literacy, open government, Riccardo Luna on 25 November 2014 by Alberto.